This project was for a young professional who had no tolerance for clutter but boy does she love to read. From the first site visit, I had my heart set on the books she had. She loves colors and is not scared of them. Client from heaven… She rents a typical railroad house in Brooklyn and it came with its own challenges as far as laying out the space. I created three zones for her and right in the middle sits her throne to read her gazillion books. Photography by Daniel Wang. The design classic WOMB chair in a beautiful Chartreuse Felt with chrome legs is the main feature in the room againt backdrop of this amazing bookshelf styled by color. Couch, library and dining / working… thats how I divided the space. 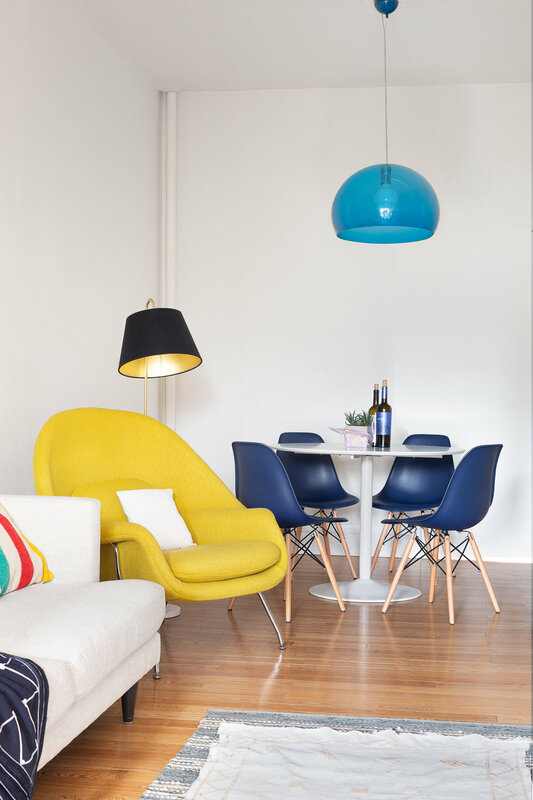 The playful pendant lights add some much needed color in the tall ceiling and artless walls.